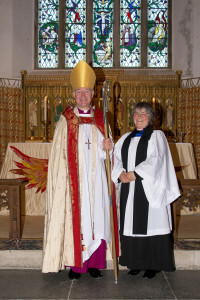 At the end of April we welcomed the Reverend Brenda Jacobs as the Vicar of Lundy when she was installed as the Team Rector of the Hartland Coast Mission Community at St Nectan’s church, Stoke in Hartland. Brenda joined the PCC when they travelled over to Lundy earlier that month and she attended a service led by Reverend Chris Baillie. We look forward to seeing her on the island as often as possible. Well, if I am to become known to you all, a little introduction may help. I am married to Paul and we have 6 grown up children and almost as many golden retrievers. Most of the children, unlike the dogs, have left home but return frequently. I was ordained in 2009 and served my curacy in Hereford City, where amongst other things, I looked after All Saints Church, which had a commercial café running inside! 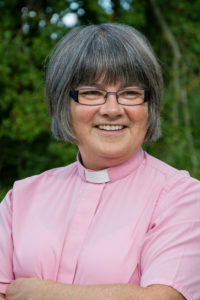 Before I was ordained I worked as a Primary school teacher at St. Paul’s in Hereford and prior to that as a co-ordinator for voluntary and community groups. Paul and I love this part of the world, having holidayed here for over 30 years. We, and our dogs especially, love the sea and so it is a real privilege to now be able to live here in Hartland. One of the great challenges of arriving as a new Vicar, is that of getting to know you all and all that goes on. So if you see me around, help me out and stop and introduce yourself!